Can you be homesick for a place you have never called home? I miss Australia. I miss the smell of the air, the sounds of the voices, the quality of the sunlight, and the amazing wildlife. To try and assuage my longing a bit, I decided to make a very Australian version of an everyday food: the humble hamburger. 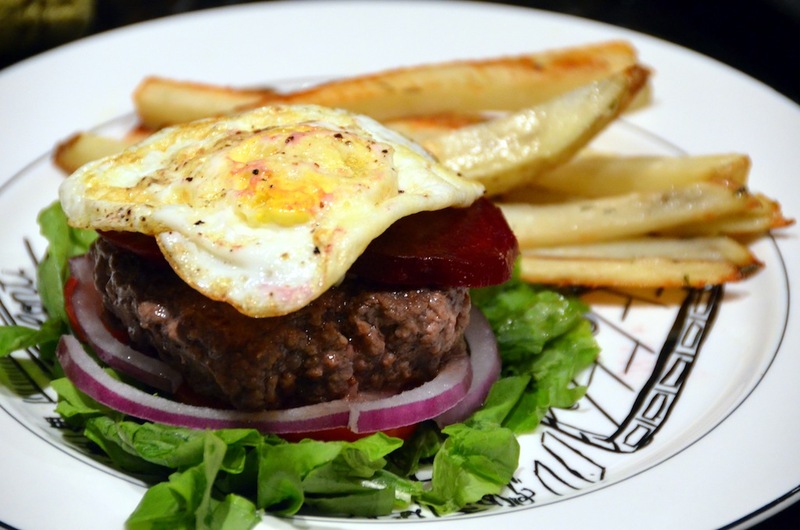 An Australian hamburger has several key elements that differ from the typical American variety: sliced, cooked beets, fried eggs, and capsicum, a condiment made from bell peppers and spices that is used as a sandwich spread. Also, rocket, a play on the French rocquette or arugula, is typical rather than lettuce, at least in restaurants. I wasn’t able to find any capsicum on short notice, but the beets, egg, and arugula were enough to bring a cozily reminiscent taste to the meal. 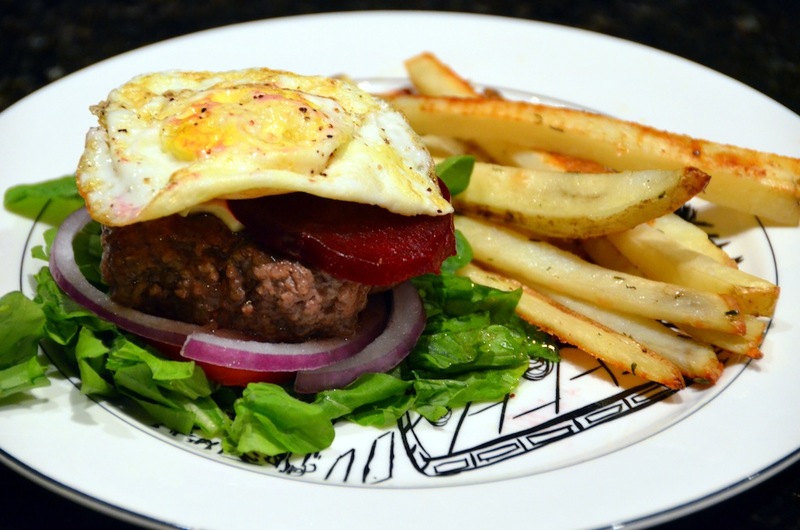 Of course, every burger needs a fry, just ask my husband. His food wish is my command, so here are two recipes for the price of one. Preheat oven to 450. Line a large baking sheet with parchment paper. 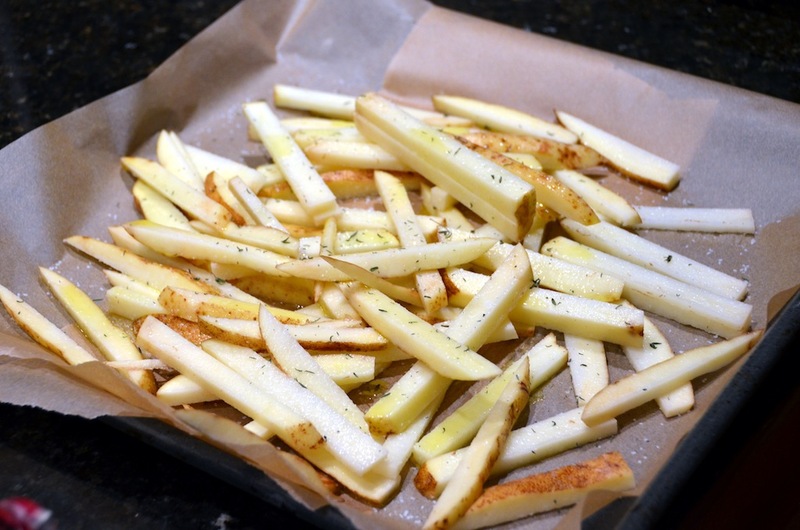 Toss cut potatoes with olive oil, salt and thyme. Cook in oven, turning over gently once, until goldeny brown or done to your liking. Check at 15 minutes and again every 5 minutes after. Heat cast iron pan on medium heat. Separate ground meat into four equal portions and, manipulating it as little as possible, form into patties. Salt and pepper the outside of the meat. Place on hot pan and cook to desired doneness. Fry eggs in a bit of olive oil or butter (just a touch). Layer on your goodies and enjoy this, perhaps unusual, treat! This entry was posted in allergy elimination diet, beef, dairy-free, dinner, gluten-free, lunch, meat, recipes and tagged allergy elimination diet, allergy elimination diet recipe, Australia, Canberra, dairy-free, eggs, elimination diet recipe, gluten-free, recipes on November 26, 2012 by Brandy. Note: I have tried to photograph this recipe at least three times since November. Every single time something goes wrong, without fail. So this time I am simply putting up the pictures I was able to get and asking you to trust that this recipe is worth trying! I’m dedicating this post to two of my friends: Mr. W. Libby, who said o.i.h. could use a bit more meat and potatoes (I aim to please), and Mrs. Kelly Oliver, who questioned the possibility of a really great steak without a grill (I believe it can be done!). 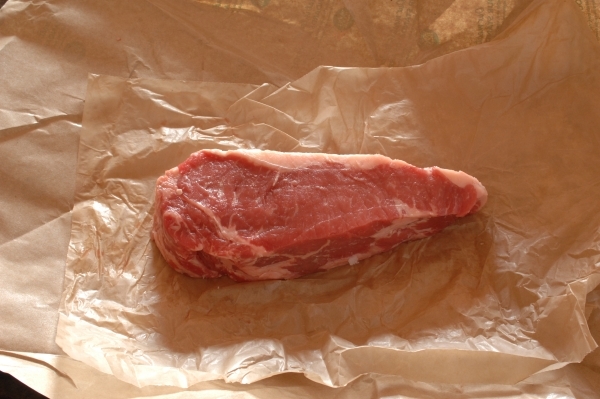 If you are participating in the allergy elimination diet, this is a great steak for you. Simply substitute a high heat oil anywhere butter is indicated! Growing up, the best steaks I ever had didn’t come from a restaurant. Restaurants produced flavorless slabs of hard to chew meat, never cooked to the customer’s specified degree. The great steaks of my childhood were found at home. My dad cooked them, under the broiler, covered in garlic and glistening with butter, and I thought they were the best. My technique as an adult is a bit different, but its origins are definitely inspired by my dad; my dad, who ingrained in me (among other things) the idea that meat cooked properly does not require sauce. ( The fact that my husband did not grow up with that mantra led to some severely hurt feeling while eating our first meals as newlyweds!) So this steak is jam packed with flavor, no sauce required! Season liberally with ground cumin, kosher salt, freshly ground black pepper and, if desired, rub with fresh or powdered garlic. 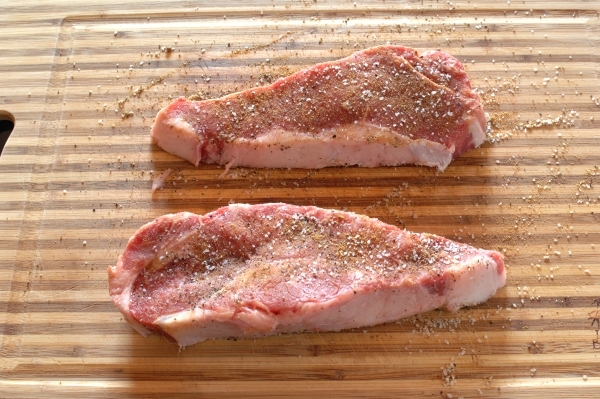 Rub seasonings into both sides of steak and allow it to rest at room temperature while you preheat oven to 425 degrees and begin heating a cast iron skillet over medium on the stove top. For your cooking fat I strongly recommend butter (sounds super healthy, I know) but you can also use ghee (butter with milk solids separated and removed) or a high heat oil (using h.h. oil instead of butter makes this recipe great for the allergy elimination diet! See our a.e.d. Food Guide for options). 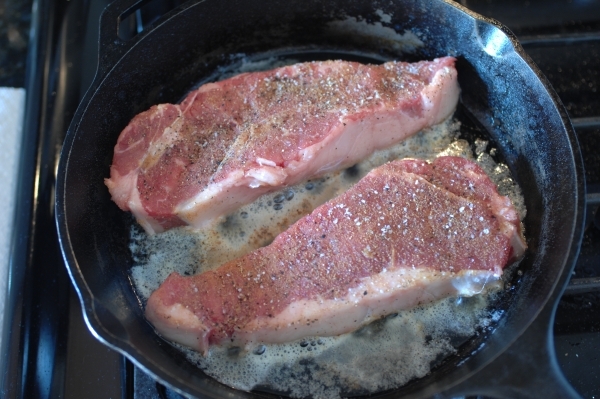 Once your cast iron pan is thoroughly heated–flick some water from you fingers and listen for intense sizzle–add roughly 1 tbs unsalted butter to the pan and melt.When butter begins to bubble and brown place steaks in pan and LEAVE IT ALONE. You want to develop good, crusty browning on each side of the steak to lock in juices and create good texture. . .this will not happen if you constantly move the meat around. 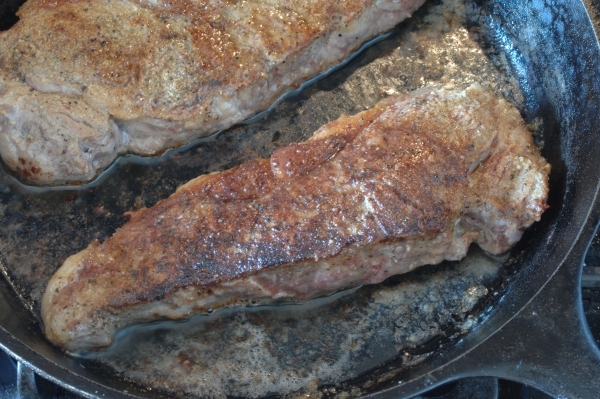 Around the 1.5 to 2 minute mark, raise one of your steaks and check for browning. 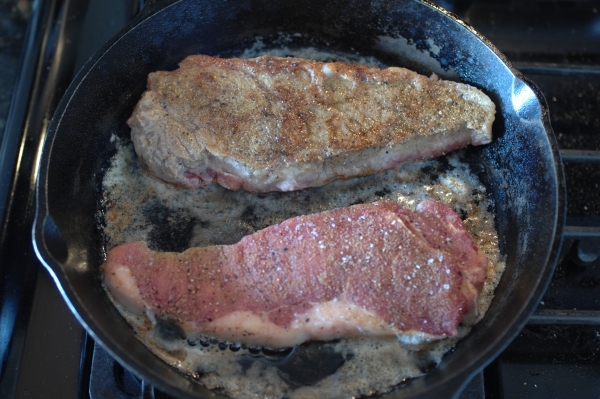 Once color is good, flip both steaks and continue to brown on stove top for another 1.5 to 2 minutes. Transfer pan from stove top to oven and continue to cook to desired doneness. In this house that is medium (that is our compromise between my vampiric tendencies and Jason’s medium-wellness).That means for this steak we do about 5 minutes in the oven before removing and setting the meat out to rest (either spooning pan juices over the meat or putting a little pat of butter on each). If you are uncertain about meat cooking times here is a handy, dandy chart I found on the Canadian Beef website. Now, you may be thinking, didn’t she promise meat and potatoes? You are absolutely right. This is the most perfect meat and potato marriage I have ever experienced. The flavor combination is beautiful and I strongly encourage you to step outside the Idaho potato box and try something new over at The Traveler’s Lunchbox. Doing the A.E.D? Try substituting avocado for the feta! I’ve now made myself thoroughly hungry, so I’m off to my left-overs. Bon appetit! This entry was posted in allergy elimination diet, beef, dinner, gluten-free, lunch, meat, recipes and tagged allergy elimination, allergy elimination diet, allergy elimination diet recipe, gluten-free, recipes on May 11, 2012 by Brandy.